While the course is aimed at virtual assistants, it’s a course that provides tremendous value for anyone interested in learning how to become a skilled Internet marketer. Take a look at the course outline, which includes how to do market research, how to set up an effective email marketing campaign, keyword research, and how to use analytics, squeeze pages, search engine optimization, article marketing, competitor analysis, and affiliate marketing. As an Internet marketer and/or Websmith, I can tell you that the information provided in this course teaches the foundations of online business success. 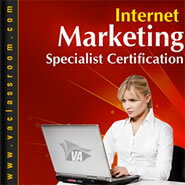 You may have taken some basic Internet marketing classes online or you may have watched a few how to videos. If so, then you know that not all courses are created equally. Clear communication and a well thought out course are essential. The VA Classroom training is top notch. The teachers are fantastic and the information is presented in a logical and easy to understand manner. I received my own Internet marketing strategies certificate from them, and I was absolutely impressed with the training available there. VA Classroom is an organization that provides specialized training for virtual assistants. The field is expanding rapidly as more and more businesses realize the tremendous value that virtual assistants provide. VA Classroom offers classes on everything from Internet Marketing to social networking and how to launch a new product. It’s good information for everyone interested in succeeding online. And if you’re starting your own Internet marketing business the VA Classroom courses can help you learn how to make the most of your own virtual assistants. They have a reputation for top quality classes and exceptional customer service. The VA Classroom Internet Marketing Specialist Course, along with their other courses, is refreshed as information and technology change. You won’t find last year’s tactics in this course. They update it to keep it fresh and informative. The information is also presented over five weeks and includes more than 25 videos. You also have unlimited access to the information which means you can go back and review the lessons as you need to. Finally, the course is packed with resources you can download and use to build your dream Internet marketing business. The Internet Marketing Specialist Course may be the single “go to” resource you need to finally launch your online business. Click Here… to be taken to my affiliate link. I’ve personally taken this course, and I highly recommend it if you are either looking into becoming a virtual assistant, or if you simply need to learn the ins and outs of what your virtual assistant can do for you after taking this course.